Kornati archipelago consists of 150 islands, 89 of these islands are protected as a national park. The national park Kornati is situated in North Dalmatia, between Zadar and Šibenik. Do not expect to find there the latest trendy restaurant, shops or nightclubs. Kornati is made of rocks and clear blue sea. Cliquez sur la photo ci-dessus pour visualiser la plan du parc national Kornati. Since the vegetation is quite rare on the islands, we don’t find there many animals. We can mention the seagulls, which are the most numerous animals, there are also lizards and snakes, rodents and 69 varieties of butterflies. The marine fauna consists of turtles, shellfishes, crabs and 160 species of fish. Let’s mention the presence of the ‘Noble pen shell’ or ‘Pinna nobilis‘ that looks like a giant mussel and that is strictly protected. During your stay in Kornati you should have the chance to see dolphins who live in this area. The vegetation on the islands is very poor. We find there Mediterranean plants, aromatic and medicinal herbs. The olive trees represent about 80% of cultivated land, followed by grapes, figs, fruits and vegetable. The marine flora is typical of the Adriatic and Mediterranean sea with some particularities such as seaweeds, corals and sea sponges. If you have your own boat you will feel in paradise in the Kornati National Park. You can enjoy yourself in this maze of islands and islets and stop at any time you want to take a swim. Make sure you buy your ticket to the national park before entering, otherwise the price will almost be double once in the park. Tickets can be purchased in Murter at the agency ‘Aba’ or in most marinas of North Dalmatia. The price for the day is between 20 € and 105 € and depends of the size of your boat. 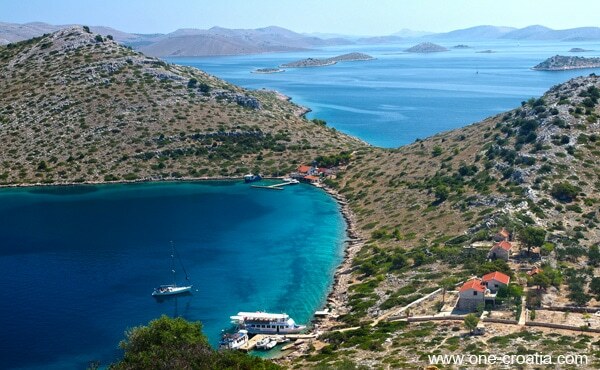 You can book a day tour to discover the Kornati islands in the main towns of North Dalmatia. The captain of the boat decides the departure time that depends on the time required to access the park. You should know that the closest harbour is in the town of Murter situated 17 km from the entrance to the park. In general boats leave at 9:00 am and return around 6:00 pm. You’ll have a break to enjoy the sea and one for lunch which is included in the price. Count about 35-40 € per adult, 50 to 100% reduction for children. The entrance ticket to the park is included in the price. Go to any agency of North Dalmatia to get more information and book your day tour to Kornati. If you are used to scuba diving you will enjoy a unique and unforgettable experience discovering the underwater world of the Kornati islands. However be aware that you will have to contact a diving center that organizes excursions to the park because it is forbidden to dive with bottles in the national park as an individual. The price of the entrance to the park for divers is 150 kn (about 20 euros) per day. Please contact a diving center of North Dalmatia for more information, you will find the list on this web site. You do not have to practice scuba diving to enjoy the underwater world around Kornati islands. You can enjoy yourself with just a mask and a snorkel. You do not need any permit or authorization so enjoy, you will discover all kinds of colourful fishes and shellfishes. It is easy to reach the top of the islands, however remember that it’s very hot during the summer and there is no much shade once there. So do not forget to take a bottle of water with you and a hat. Once at the top you will have a great view on the Kornati archipelago. Recreational fishing is allowed in the park except in a few protected areas that are closed to the public (Purara, Klint, Volić, Mrtenjak, Klobučar, Mali Obrucan and Veliki Obrucan islets). You will need to purchase a license that you can buy from the national park authorities. The price is 150 kuna (about 20 euros) if purchased outside the park, it will cost you double price once in the park. Kornati is the ideal place for those who want to escape the daily stress and spend a holiday away from everything. Imagine yourself as Robinson Crusoe. Here no water or electricity, we use rainwater instead and solar energy or gas. Yet we find in the Kornati islands many restaurants and houses that would have been a luxury for Crusoe. There is a boat going from island to island twice a week, selling grocery. 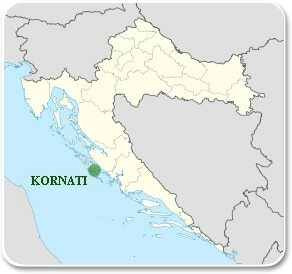 The island Kornat is the largest (25 km long and 2.5 km wide) and the most populous of all. Spend your vacation in the National Park Kornati and enjoy peace, nature and clear blue sea. Click on this link to book a house on Kornat island.